Welcome to “DiaDENS” a biofeedback pain eraser. Our bodies, like the universe itself, are alive with electromagnetic forces. Life energy extends beyond the boundaries of our skin, as the latest research shows. By accessing the biological fields surrounding the human body and altering them in beneficial ways it is possible to treat diseases in a radical new way. DENAS and DiaDENS are today’s advanced versions of SCENAR®** biofeedback apparatus that were originally produced in the 70s by Russian medical organizations. They were initially designed and intended for cosmonauts’ use. It is Important to Note that in Russia today, DENS-Therapy is a part of the mainstream medicine and it is registered by the Russian Ministry of Health as an official independent method of treatment. It is taught in medical colleges as a separate discipline and may be pursued by students as a major professional specialization. There is often no need to suffer from pain, soreness, out of balance body voltage, acute distension, distress, or almost any superficial infliction, illness, ailment, major pathology or physical disorder. Painful arthritis and osteoporosis can be of the past for you. Additionally, a DENAS or DiaDENS instrument can help alleviate conditions such as an aching backache, muscular pains, caused by overwork and activity as well as many internal related pathologies. When ordinary medical remedies which involve drugs or pharmaceutical medicines fail you and cause new problems, it may be time for you to consider this new “space-age” solution. Additionally, when you discover that pharmaceutical and so-called methods of prevention are not really helping to correct the cause of your ailment, you may want try a new and different method. That “new method” is actually tried-and-true and proven effective throughout Europe, Australia and Russia. That method is DENS-therapy. DENS-therapy is really effective and may be an excellent solution to help you resolve problems with your health problems. DENS-therapy provides a solution that is a hi-tech, “Star Trek” type of therapy, a much less invasive solution. The only thing you will feel is a slight sensation caused by the DENS device. In short, properly using a DENS device may bring you wonderful relief and to a healthy state of strength, and wellness. 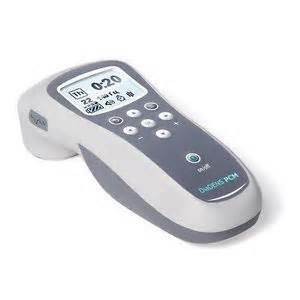 Biofeedback, via the DENAS and DiaDENS instruments, invokes your natural immune system. The instrument, and your own physical biofeedback, instructs the apparatus to generate a signal that will be appropriate for dealing with your physical areas of distress. As a result, your physical system will quickly provide normal spontaneous healing energy to help reduce, or eliminate, your painful infliction or hurt, and to begin natural healing. As the DiaDens is moved across an area of the body and it picks up an area that needs treatment there will be both be tonal alert as well as a sensation of “stickiness” along the skin. This is where the device will start delivering the necessary electrical frequencies to rebalance the body. This will not only have a pain elimination affect but will also stimulate a more balanced function to that area of the body. It is not only beneficial for pain but can also help function of the internal organs. The electrical frequencies that your body needs can be delivered directly from the unit or through pads placed on the body. The pain and symptom relief will have an accumulative effect. In other words if the first treatment caused a two-hour relief of symptoms then the second treatment could cause 4 to 6 hours of relief until the underlying problem has been completely resolved. Very often after just a few moments of treatment, patients will sigh (called the “Diadens sigh” by experienced practitioners). Sighing and yawning are known to be signs of emotional release. When emotional tension is released, the way a person breathes becomes deeper, more relaxed, and normalized. So breath, emotions, and neuropeptides are closely related. Do you know someone in pain? Tell them about Keefe Clinic. This entry was posted in Knowledge Base and tagged acupuncture, Aspirin, Back Surgery, Constipation, depression, Diarrhea, Dr. keefe, drugs, Fibromyalgia, pain, tulsa chiropractor by DocJohn. Bookmark the permalink.